Cranachan & Crowdie is a high quality Scottish food, drink and gifts shop on the Royal Mile. 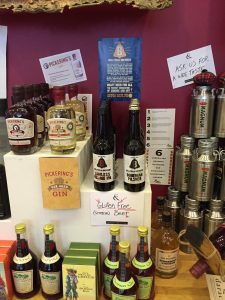 As well as serving some great whisky, gin and beers, the shop also has a good gluten free section. The staff are really friendly and it is a great place to buy gifts or just seek out some of the best quality gluten free treats. Biscuits include: the Angelic range; Scottish-based Pulsetta; Against the Grain – an organic range of GF biscuits made by the Island Bakery on the beautiful Isle of Mull; and another Scottish quality producers, Lazy Day Foods, which makes a terrific gluten free shortbread. It would be good if the shop also stocked those fantastic gluten free Deans Shortbread, but let’s hope they do soon. At the moment I can only find them online. 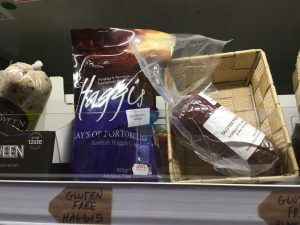 Also worth seeking out in Cranachan & Crowdie is the Findlays of Portobello GF haggis and black pudding, also available in the chiller section. This is the only gluten free haggis I have come across so far and is really delicious. The butchers also make fantastic GF sausages and sausage meat. The other great gluten free product in Cranachan & Crowdie is the great new Edinburgh-produced GF beer from Bellfield Brewery. This is the place to get your summer evening lager! It is worth meandering down the Royal Mile to visit this place. As well as the GF goodies they also have great gifts such as quirky teatowels, Scottish woolly items (plenty of sheep-themed ones!) and pottery. It’s a great place for a potter and I love it!